To build ZecWallet locally, you need to install Qt v5.11 or higher. You can get the latest opensource version from the Qt download site. 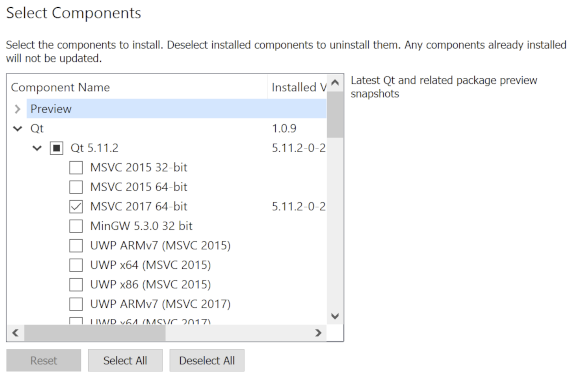 Download and install the Qt version for your platform. During the installation, you should also select the build version for your platform/compiler. ZecWallet is written in C++ 14, so you’ll also need a modern C++ compiler like g++/clang++/visual c++ depending on your platform. You need Visual Studio 2017 (The free C++ Community Edition works just fine). Alternately, you can cross-compile on Linux for Windows using the mingw compiler. See cross-compile instructions here. You need to install the Xcode app or the Xcode Command Line Tools first, and then install Qt.